About a month ago, this post appeared as a guest post on finallygettingtoeven.com, but it has never appeared here. It’s your Friday bonus post. On July 7, finallygettingtoeven’s writer was featured as the second-ever guest poster on my blog. She told my readers a story about saving $7,000 on a vehicle purchase by doing her research and being willing to drive for hours to a faraway dealer for the best deal. 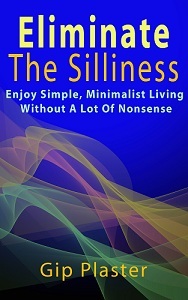 I blog at So Much More Life about living a “simple, deliberate life”. That means I try to eliminate useless things, processes and spending from my life. Making deliberate choices rather than spending, working and consuming without thought is my path to a life better than I ever imagined possible. Among my efforts to simplify my life this year, I’ve been decluttering my home. I started in the kitchen, and one of the things I threw away was a damaged toaster. Who needs a toaster? I had rarely used the old one, then it got wet and was useless, so it needed to be thrown away. But every now and then, a guy wants a piece of toast. A simple toaster costs less than $7 at Walmart, and — I hypothesized — it would be good enough for me. But did I really need it? The part of my decluttering efforts that I’ve enjoyed most are the now totally clean countertops in the kitchen. But I could keep the toaster underneath and bring it out only when I want to use it. Toast, I finally decided, is part of a simple life. Nothing is simpler than toasted bread with butter or jelly. You see, living a simple, deliberate life doesn’t mean you need to deprive yourself of anything. It means you don’t clutter your life with things that don’t contribute to your happiness. And it means that whatever you do, you do it mindfully. That is, you think about the things you’re doing and their implications. So make deliberate choices — whether you’re trying to save $7,000 or spend $7 for something that will make your life better. Choosing carefully will always serve you well. once again we are of like minds. I do exactly that, consider every purchase big or small. Nothing like living through hard times to make you appreciate money and its worth. I often look at items in the supermarket shelf debating value for money and if the item is a luxury or really needed. It astounds me when people just walk to the shelves and take whatever item they want never considering the price or value. It can breed a poverty consciousness but it is a good discipline as long as it does not control you. My uncle lived through the war in Europe and he went overboard even though he had enough. He never wasted a thing but fear bound his thinking from his days of lack, decades later. It is all a matter of choices. Thanks for commenting on my blog again. Good to have you all here. And Andre, it’s nice to see your face showing up. There’s a balance somewhere between weighing every purchase and wasting your time. At a certain point, you have to give in and move forward. I do read labels and compare prices. It’s hard to imagine not doing that. I wonder – did you consider buying a secondhand toaster? Odds are, with a new $7 Walmart toaster you will be considering another toaster purchase soon. Many secondhand toasters you can find in op shops are of better quality, even if not as pretty, than new merchandise made from cheap labour overseas. Jess — Thanks for commenting again. I’m actually surprised to see comments to this post. I thought it had lived its life once over on Jan’s site, so I didn’t expect much here. I spend a lot of time in used merchandise stores because of my book business and because I sometimes buy clothes there, but I don’t buy used electrical appliances. It’s simply not worth the risk of fire or the potential waste of getting something that doesn’t work. I don’t equate older with better made or with better working conditions. I don’t know of any company that’s made small appliances in the U.S. in many years, and I’m not nation-centric. I’m happy to support economies in other parts of the world as well as my own. I don’t know where my toaster was made. I know there are people who are opposed to Walmart because of their purchasing tactics and their impact on small businesses in some towns, but that is a very narrow view of the company. Like many of the companies I deal with, I neither like nore dislike them. By the way, since you spelled “labour” with a “u”, I suppose you are overseas to me! Gip, I would do some research on why the exploitation of third world labor is unethical. It is not only tragic for those employed in other parts of the world, but it outsources jobs from here so that transnational corporations can make more and bigger profits. It’s only the corporate elite that win here. Besides the quality control goes down when things are made so cheaply. There are many good documentaries on the subject. I suggest you look into it more so you can be better informed next time the subject comes up. It’s not about nationalism, it’s about business ethics. I appreciate your comment, Albert. Every comment matters. I hope to see your name around here often. Just migrated over from 365lessthings after seeing you in the Friday Favorites again – good job. And nice post. Too much wasteful spending on useless things comes from thinking “oh, it’s just $7.” Doing that repeatedly adds up! If everyone agonized over that $7 a little more, we’d all be in better shape financially. PS – our toaster gets a workout – toasted bread, toasted bagels. It’s all in whether an item meets your needs and repays its cost in useage and longevity. You’ve got it exactly right, Donna. Thanks for joining the conversation here. I love the picture, by the way. I hope you’ll be commenting regularly.